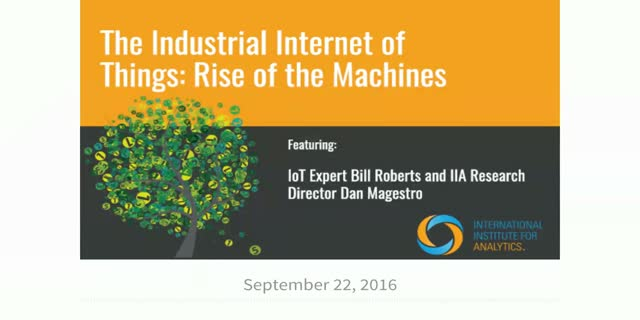 Presented by IoT expert, Bill Roberts, this webinar explores how the Industrial Internet of Things (IIoT) is having a dramatic impact on how manufacturers and service providers operate. From the factory floor to a distributed energy generation facility to anywhere a critical piece of equipment operates, machine data holds enormous potential to drive high levels of operational efficiency and unlock new service innovations. This blending of operational technologies (OT) with Information Technology (IT) has created challenges with the data, the analytics lifecycle and a deep thinking into the roles of personnel. A robust IoT analytics lifecycle can play a critical role in helping organizations separate the relevant signals from the noise in IIoT data, gain real time critical insights, and drive appropriate, timely action to realize the promised value of IIoT. This session will explore these topics and offer insights on pursuing a successful industrial IoT strategy that leverages a robust analytics lifecycle.